mainemason is one of more than 5,000 organizations on LibraryThing. 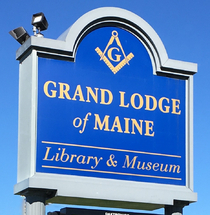 About meThe Grand Lodge of Masons in Maine Library & Museum - The fraternity of Freemasons! Our library began in 1843 and is currently undergoing a conceptual revival and, thanks to the generosity of so many, a physical expansion as well. About my libraryWe have a broad and growing collection and welcome the Masons of Maine as well as their families, friends and communities to come and visit us, both physically and online. We welcome you! We've highlighted some of our recent holdings and we welcome you to visit our online library catalog for more.